If you’re an avid blogger or have an ambition to enter their squad, you need a modern, responsive website template that takes your blogging efforts up a notch. If you’d like to gain visibility online without braking the bank, you need one of the top-notch WordPress themes produced this year. In this post, I want to help you settle down with the best possible template for your website, and present top 10 responsive WordPress themes for bloggers that came out recently. If you create a website with blogging in mind, WordPress is unquestionably one of the best solutions. This simple and comprehensive CMS lets you built a SEO-optimized, feature-rich blog within a short period of time. If you want to check out more WordPress themes, explore the new collection of Responsive WordPress Themes, produced by TemplateMonster, one of the leading companies on the template market. And what’s great about these themes, they all come with 24/7 free Live Support and can be customized additionally by professionals at TemplateMonster Service Center. I think it’s time to meet the 10 responsive WordPress themes that are truly the best ones for bloggers. Do not forget to learn more about the template you like by pressing ‘Details’ and ‘Live Demo’ links under the screenshot. Let’s go! StyleQueen theme is developed for all the fashion lovers who want to develop their passion and reach out for the global audience. 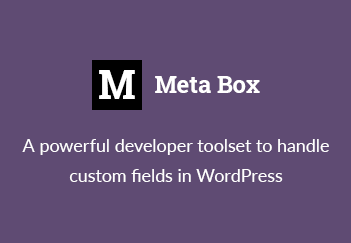 The template is enhanced by multiple custom widgets and rich social integration, and can be customized in live mode thanks to prebuilt WordPress Live Customizer. This clean and minimalist WordPress template is a great choice for travel blogs. Besides, it has good documentation, so you can adapt different elements of its design as per your own needs without someone else’s help. The theme is fully responsive and cross-browser compatible. It also features a flexible mobile menu, which is intended to adjust to all screen sizes. The template includes advanced theme modification options, making it easy to adjust the layout to fit online agency and magazine sites. Breviter Pro is a fully responsive, modern, stylish premium WordPress template that is optimized for a quick and speedy performance in a variety of web environments. It goes with 4 header styles, 2 footer styles, 3 blog feed styles. The theme has a number of theme customization options and page building solutions, making it really quick and easy to personalize the template as per your own requirements. 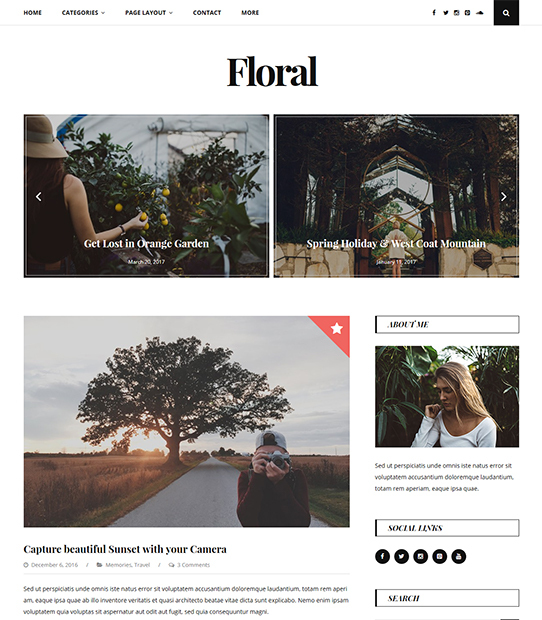 Floral is an elegant and modern theme for personal bloggers. Its classic layout, stylish typography, and vintage color palette are perfect for personal, lifestyle, fashion, or travel blogs. Having clean design and minimal layout, Clean Blog theme fits the needs of every creative blogger. The theme is SEO-optimized and displays equally well across different modern browsers (Chrome, Safari, Firafox and IE 9+) and devices with different screen resolutions. 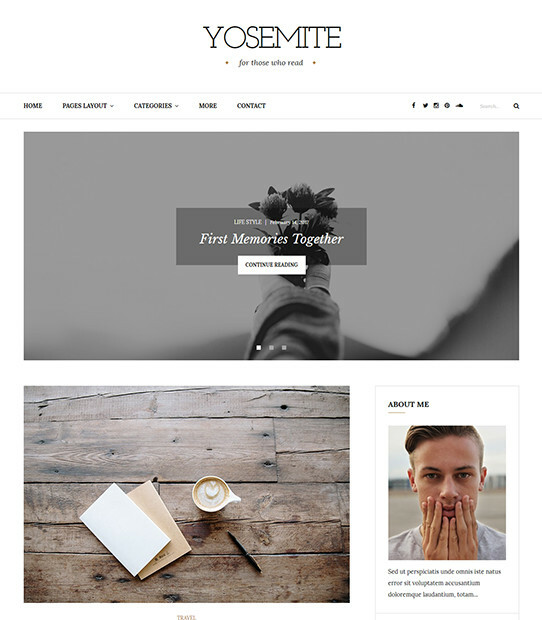 Yosemite is a free WordPress theme that will help you build your personal blog. 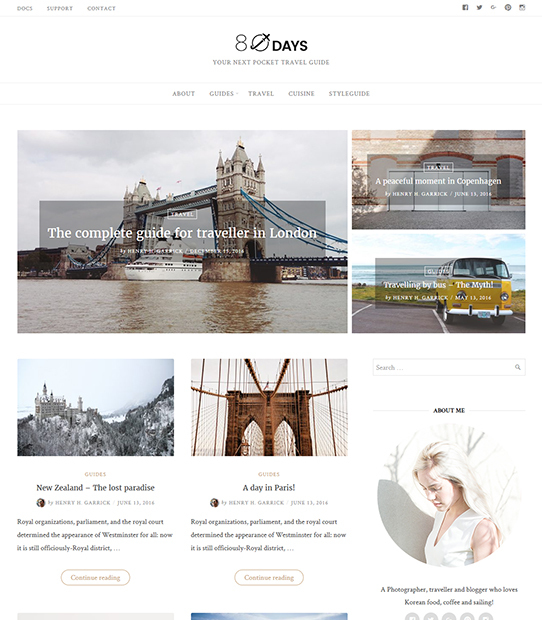 This theme has a classic layout, stylish typography and is a perfect choice for personal, lifestyle, fashion, or travel blogs. Creative Blog theme combines bright visuals with clean and well-structured layout. The theme centers on incorporation of different content types to your website. It also supports videos and audio podcasts, as well as with bright imagery and fun iconic fonts. If you need a perfect blog theme that lets your personality shine bright, go for modern and atmospheric Identiz template. With this theme, you can not only power an avid blog, but also run a fully-fledged e-store. Flash is a feature rich multipurpose WordPress template that combines ease of customization with breathtaking theme’s functionality. The theme comes with an inbuilt drag-n-drop editor, 6+ widget areas and 18+ custom widgets. It also supports advanced color and typography options. With this elegant black-and-white personal blog theme, you’re one step closer to creating a blog that will conquer the realm of Internet. This responsive and cross-browser compatible theme is Retina and translation ready and offers you multiple color management and font options. If you strive to create a style blog of your dream, this template will impress you with its modern uncluttered design and trendy look. It includes a number of custom widgets, such as slider and social media widgets. They will help you establish a strong online presence and display your website contents in the most appealing way. I hope you feel even more inspired to create a blog now as you can get hold of one of these wonderful responsive WordPress themes for blogging. I wish you good luck in creating you dream blog with one of these templates! If you have any questions, I’ll be happy to answer them in the Comments section below. Thanks for sharing this useful information. Your list is spectacular. I would like to add one more responsive & Multipurpose WordPress theme Kosmic. It has lots of amazing features to make your website more attractive.